Preheat oven to 350 degree F. Line an 8-inch square baking pan with foil, leaving a 1-inch overhang on 2 sides. Mist foil with cooking spray. Make swirl: Using a mixer on medium speed, beat cream cheese and butter until creamy. Add egg; beat until smooth. Beat in sugar, flour and vanilla until smooth. Set aside. Make brownies: In a double boiler, melt butter with chocolate, stirring often. Remove from heat; stir in sugar, vanilla and salt. Transfer to a bowl; cool slightly. Using a mixer on medium-low speed, beat eggs into chocolate mixture 1 at a time. Sprinkle flour over mixture and gently stir in. Spread 1/2 of brownie batter in prepared pan. 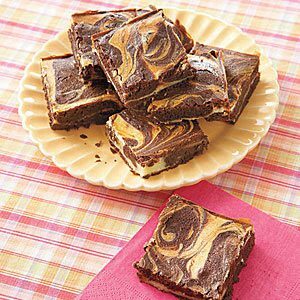 Carefully spread swirl mixture over brownie batter. Spoon remaining brownie batter on top. Use tip of a knife to gently swirl through both batters to form a marble pattern. Bake until a toothpick inserted into center comes out clean, 40 to 45 minutes. Let cool on a wire rack for at least 1 hour. Remove brownies from pan to cutting board using foil to lift them out. Peel off foil and cut into squares. These freeze very well if you want to make in advance. Simply take them out the day of the concert, and they’ll be perfect by dinner.